Asia is one of the emerging regions in world economy. Most countries in Asiaare rapidly developing its economic activities to catch up with theiradvanced neighbors such as Japan, South Korea and Taiwan. The region is actively involved in bilateral and multilateral free trade agreements and negotiations and economic blocs, importantly ASEAN Economic Community (AEC) to be started in 2015. In this situation, agriculture is not only given a lower priority to industry and financial sector, but the resources that sustain small scale farmers are increasingly grabbed away to feed them, including land. Land problems already exists in Asia perpetually even before the rush toward economic growth in recent years. They are ones of the most severe challenges for small scale farmers both in the advanced countries and poor countries.Land problems are in various forms such as landlessness, land grabbing, land insecurity, and denial or violation of customary laws on land management and ownership. To counter the challenges, small scale farmers in Asia have been organized and struggling for land reform for decades at community and national levels. Many of them join La Via Campesina (LVC) which is the international movement of peasants, to bring their issues to regional and global attention. La Via Campesina (LVC) becomes a good source of knowledge accumulated from numerous first-hand experiences of its members on land reform. Besides, LVC is the global advocate for food sovereignty of which land is the foundation. With its 20 years in actions, LVC has lots of lesson learned to share with small scale farmers worldwide. In February 2014, LVC of Southeast and East Asia will come to Bangkok for the Regional Meeting. Assembly of the Poor (AOP), which is the LVC member in Thailand, will be a host for over 40 small scale farmers from 14 countries in Asia and Pacific. 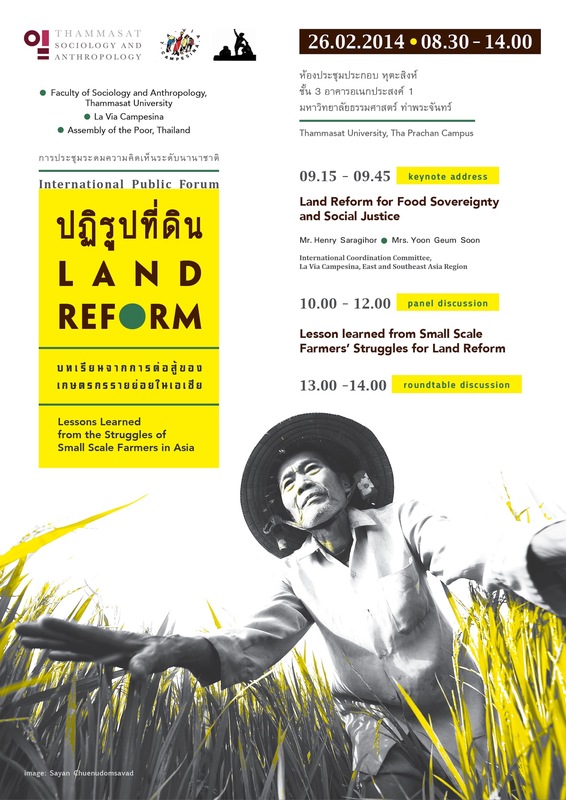 To make maximum use of their experiences in land reform, AOP would like to organize an international forum for small scale farmers and other social sector in Thailand to learn from them and to share theperspective and experiences from Thailand. The international forum will also strengthen the cooperation among small scale farmers in Asia. วันพุธที่ 26 กุมภาพันธ์ 2557 เวลา 8.30-14.00 น. 26 February 2014 || 8.30-14.00 hrs.